Here it is: the ambient, algorithmic art video the Shanghai Cultural Bureau doesn’t want you to see! Transportation Is Getting a New Look from Ben Houge on Vimeo. This piece was first exhibited as part of the “Re-Visioning History” show that opened on May 22, 2010, at OV Gallery in Shanghai. Less than a week later, representatives of the Cultural Bureau came in and shut down the show, walking off with a print from my video. It’s not clear why my work was singled out for confiscation. The show was centered around the work of Zhang Dali 张大力 and Ren Hong 任虹, with several other artists (myself included) invited to present new work based on a collection of historical propaganda posters on loan from Madame Mao’s Dowry. Most analysts agree, and I wouldn’t argue, that my work was probably the least politically oriented in the show. It may simply have come down to my work being most portable and closest to the door. Oddly, they only took one of the two prints I made from the video, ignoring the video itself. The principle objection seems to have been to the work of Zhang Dali. 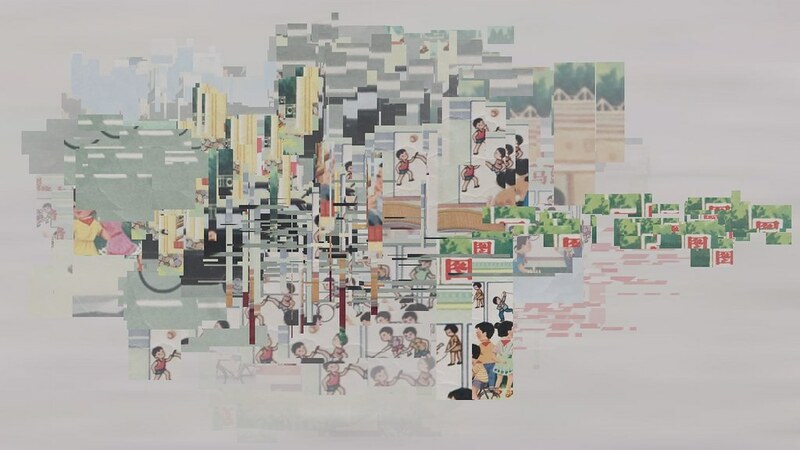 His work was drawn from a 7-year project called “A Second History,” in which he used his connections to gain access to the national archives in Beijing. He managed to locate the original, historical photographs that were used as the basis for various propaganda posters, which he then incorporated into work that presented both versions of history side by side, in digital prints, silk screens, and paintings. He had already exhibited this work several times without major incident, most recently at the Guangdong Museum of Art, though the rumor is that after the Guangdong show he was pegged as someone to keep an eye on. The most plausible explanation I’ve heard for the OV Gallery show’s closure is that the powers-that-be didn’t want to come across as enemies of culture by officially censoring the show (especially with heightened foreign attention during the Shanghai Expo), so instead they got the gallery on technicalities like selling catalogues and exhibiting foreign artists without a license. So it in all likelihood had nothing to do with my art (which does not mean I’m not mentioning it in every grant application I write from this point forward). You can read more about the incident in That’s Shanghai, Shanghaiist, and the Wall Street Journal. And then suddenly on June 22, one month after the original opening, the gallery was permitted to reopen. They even returned my piece, which is actually a bit disappointing; I kind of liked the idea of it hanging over some Cultural Bureau functionary’s desk somewhere. There was a little reopening party on June 26, and the show’s run has been extended through August 5, to make up for the period that the gallery was closed. All of the hoopla surrounding my piece’s confiscation and the gallery closure has somewhat deflected attention from the work itself, with which, in fact, I am quite pleased. 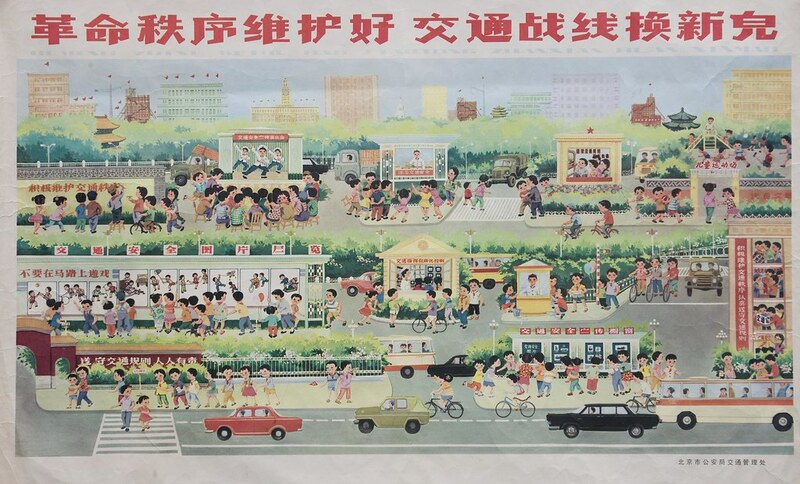 Transportation Is Getting a New Look is a real-time, algorithmic collage of snippets from a 1970’s Chinese propaganda poster entitled “Safeguard the Orderliness of the Revolution: Transportation Is Getting a New Look 革命秩序维护好,交通战线换新貌.” The point of departure was the idea of a city wall covered with posters. Old posters fade and are torn down, new posters cover them up, and a new, unpredictable form emerges from the remnants, an evolving public collage. My video employs custom computer software (developed in Jitter) to algorithmically emulate this process. The program excises sections of the original propaganda poster and pastes them onto a new digital canvas in constantly varying configurations. The composition unfolds in six overlapping “phrases” of about one to two minutes, each of which define an area to be statistically filled with snippets of the original image in varying sizes and densities. Sometimes the program focuses on one part of the source image, resulting in a consistent shape or repeated gesture. Sometimes the differences are greater: a small detail may be enlarged, or an image may be reduced to a texture or color. As new images are overlaid, the foreground is constantly receding into the background; the present forms a canvas for the future. As with Shanghai Traces, I feel this is a particularly good pairing of subject and medium. The theme of the show, and the subject of this video, is the process of the present becoming the past, forming history. The medium of generative video provides an apt opportunity to evoke this process by means of another process. The video explores the unique properties of the digital medium; you couldn’t obtain the same results (the repetition of images in varying sizes, scales, and degrees of fadedness, not to mention the systematic evolution over time) using traditional paper collage or any other medium. The video explores modes of propaganda. Slogans on posters, plastered in profusion, represent perhaps the most common form of propaganda: persuasion through sheer repetition, with no attempt at a reasoned argument. You see that happening in this piece, as the program tends to pick from roughly the same area of the source image for stretches at a time. But while working on this piece, I was also reviewing the work of the Russian Constructivist and Suprematist artists of the early 20th century, who were using pure, abstract forms to convey ideas about relationships and society: structural propaganda, still very much intended to alter society. The blocks of images that comprise my video at times resemble some sketches of Kasimir Malevich. The fragmentation of images in my work can at times feel violent as figures are chopped in half and hand-holding friends are sundered. On the other hand, one figure from the source poster can be cloned indefinitely to form an anonymous crowd or disintegrate into an abstract texture. This is not to say you have to watch the video for a long time to appreciate it; part of the point of the piece is that its generative nature allows you to make your own beginning and ending as you enter or leave the installation, so feel free to start the video somewhere in the middle and watch for as long as you want. The piece also works in an excerpt as brief as a single frame, as you can see in this Flickr gallery. The video was originally exhibited without sound. For this excerpt, I’ve added some ambient light traffic, recorded from my rooftop studio at True Color Museum, Suzhou, China, where I’m doing an artist residency through the end of July 2010. BTW, if you read Chinese, you’ll spot some odd characters popping in from time to time. These are from the second batch of simplified Chinese characters (known as “二间”) that were announced in 1977 and then rescinded in 1986, which indicates a time frame in which this poster was originally published. 皃 has since been reverted to its original form 貌, 乙+心 is now 意, 尸+一 is now 展, etc. 片 is also now written slightly differently. For an exhaustive accounting of which characters were changed when, check out this site! My newest video piece, Shanghai Traces, is just finishing its 7+ week run at OV Gallery in Shanghai. It was part of the Make Over show, curated by OV’s Rebecca Catching as a response to the remarkable face lift that Shanghai has been undergoing for many months in anticipation of hosting the World Expo this year. Construction has been even more madcap than usual, with new subway lines being built, streets being repaved, and housing blocks being repainted several lanes deep (typically dingy bricks painted brick red, with the gaps between them painted caulk white). The Shanghai apartment I vacated last December was 23 floors up, more or less just across the river from the manic construction at the Expo grounds, and the dust that accumulated was amazing. I was considering bottling it and selling it, like Mount St. Helens ash. It’s a real-time, algorithmic (or, if you prefer, generative) video running continuously in Jitter on a computer screen in the gallery, which means that this video represents a unique configuration of images that will never occur again. I find the topic particularly well-suited to the medium of real-time video, as this is the way people move through a city, constantly coming and going; you never know who you’re going to bump into on the sidewalk. It’s a never ending process. The same thing’s happening in the video: images fall in endless variation, their traces mingle, and then they disappear. Perhaps to a greater extent than most cities, many of Shanghai’s residents are just passing through. From the poorest migrant worker to the flushest CEO, people come from all over seeking opportunity, adventure, and fortune. Shanghai Traces is a meditation on the manner in which these passing characters leave their mark on the city. 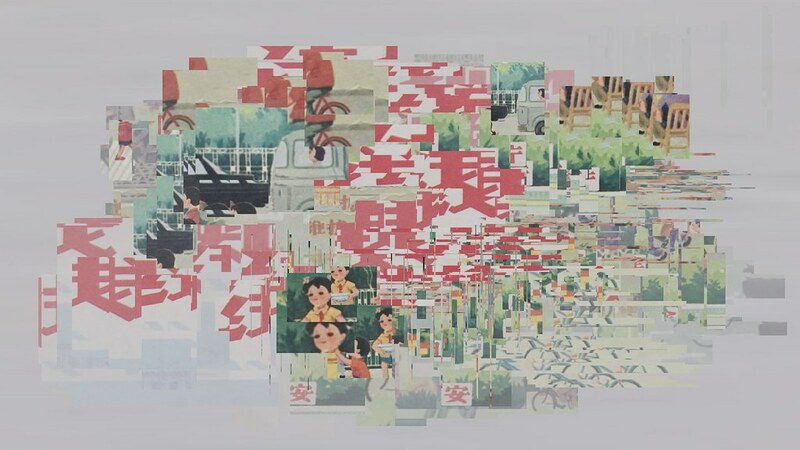 The tumbling images are cobbled together algorithmically in real-time, mirroring the interactions of the city’s inhabitants in ever-changing patterns and configurations. Some stay, many move on, but every life leaves a trace, however fleeting. Shanghai Traces exemplifies a lot of the ideas I’ve been using in my audio work, in videogames as well as installations. The computer is selecting parameters to keep things unpredictable, but items aren’t falling completely randomly; rather, you can notice that certain parts of the screen develop their own rhythms, sometimes speeding up or slowing down. There’s a list with a range of values for each item; you’ll notice that some items never change color, or that some items tend to be consistently bigger than others. See some more on my Flickr feed! The piece was originally conceived as a video only piece; no sound. I think in this silent form it works very well in a gallery setting, especially in a group show. After certain past experiences, I’ve gotten very picky about sound in galleries where other pieces are present. Nonetheless, when I started thinking about posting the video online, I decided to add an audio component, so folks wouldn’t waste time wondering what was wrong with the sound instead of just watching. So I implemented a simple idea I’ve been wanting to play with for a long time: from a stream of speech, little excerpts are plucked out and kind of frozen in time, suspended and fading out. In this case the stream of speech is a continuous babble of fragments chosen statistically from recordings of the interviews Jutta conducted. There are 30 layers of this behavior going on at once, creating a nice, ambient din. I like the way the delay time of the little frozen fragments matches the rate at which the vendor objects are falling down the screen. Further, the frozen bits sometimes take on a mechanical quality, evoking the jackhammers that have been enthusiastically tearing up the streets as part of the city’s renewal. Like any good project, this one leaves me with lots of ideas for further work. I love the density of this piece, but after this experience I’m really curious to do some smaller scale studies, to really get into details of maybe just pairs of objects, and to finely hone the combinations of color and movement (which was kind of the opposite of the objective here). It would also be fun to contrast different types of behavior as part of a larger piece, perhaps spread across multiple video screens. Big thanks to Rebecca for instigating this exhibition and inviting Jutta and I to participate! Thanks also to Jutta for being a sounding board for ideas, and for helping with the source photographs and audio!